Wakehurst defender Niall Swan holds off Portadown striker Mark McAllister during Saturday's Tennent's Irish Cup tie at Shamrock Park. Picture: Press Eye. 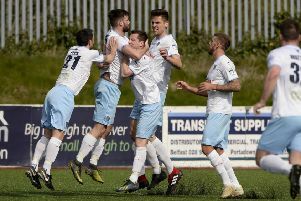 Wakehurst interim manager Dougie Stevenson hopes the Ballymena side can regain some stability after a turbulent week for the club. The long-serving club stalwart has taken charge - along with ex-player Stephen Mellon and former manager Ian Gregg - after Paul Muir stepped down during the week. The new management team’s first game ended in a 6-1 defeat by Premiership side Portadown in Saturday’s Tennent’s Irish Cup tie but Stevenson remained upbeat. “It wasn’t a match we were expected to win but we acquitted ourselves well,” said the former club captain. “Our priority is the league so one sense it was probably good not to go straight into a league game but on the other hand, if we had been playing against opposition at the same level as ourselves, it might have given us a better indication of where we’re at. “Probably the most pleasing thing was that we kept going and got ourselves a goal through Andy Laughlin - if we can show that sort of spirit as we resume the league campaign it should stand us in good stead. “Between myself, Stephen and Ian, we hope to bring some stability and get the club back on an even keel at this important stage of the season. “Paul’s resignation wasn’t something we had anticipated but it has all been very amicable and Paul was in touch with us on Friday to wish us good luck. “We will probably look to bring a couple of players in, although we believe there is a lot of talent within our squad. The new-look management team begin the task of trying to salvage Wakehurst’s Championship Two status this weekend as they face Banbridge Town at Mill Meadow. “We’ve picked up five points out of a possible 36 so far in the league so we need to get moving quickly and Banbridge are one of the sides in the lower half of the table that we have to try to catch. “A win would certainly give us a big boost as we try to get a bit of momentum built up,” said Stevenson, who will again be without influential skipper George Young, who completes a two-match suspension. Wakehurst team v Portadown: M Cairns, C McCaughern, Swan, Steele (sub Millar), McCartney, Ross (sub Armstrong), Lemon, McClelland, L McCaughern, Laughlin, Foster (sub B Cairns). Subs (not used): Alexander, Price.